"The reef to which I refer has never been surveyed & therefore I am unable to give you its exact locality". Lasseter to M. J. Calanchini, Under Secretary for Mines, W. A. 14/02/30. For all the oral history and unsubstantiated writing concerning Lasseter and his reef it comes as a pleasant surprise to find a document that clearly shows the beginnings of the Lasseter saga. 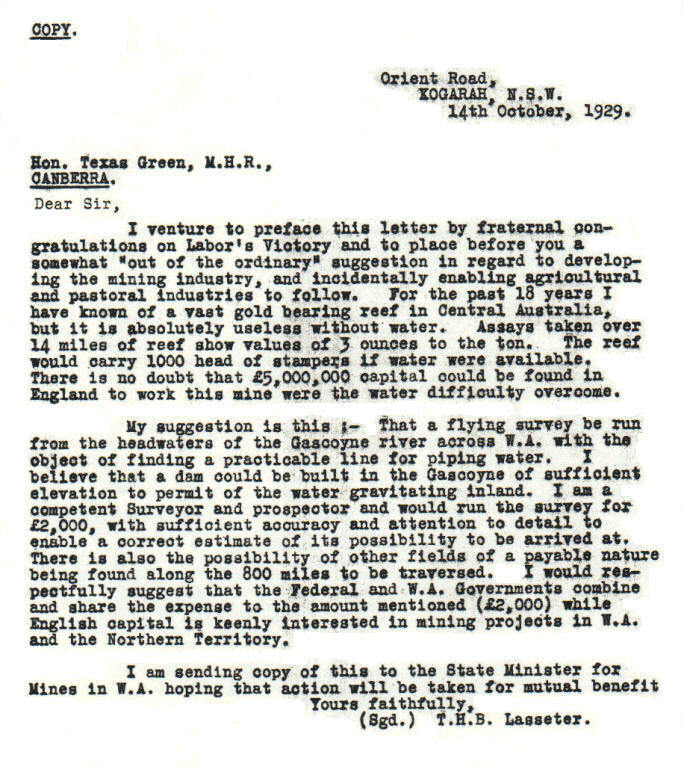 On the 14th of October 1929 Lasseter wrote to the Honourable Texas Green, M. H. R. Canberra with, "a somewhat out of the ordinary suggestion". In the letter Lasseter outlines vast plans to develop Central Australia providing sufficient water can be found to operate a gold battery with a thousand head of stampers, "and incidentally enabling agricultural and pastoral industries to follow". As with anything Lasseter there are anomalies in the letter and comments to be made, Lasseter would have been well advised not to have written the letter or least remember what he wrote and to whom. As noted elsewhere, Lasseter had known of his, "vast gold bearing reef in Central Australia", for 18 years past, suggesting he first discovered the bonanza in 1911, yet in correspondence to Calanchini in February 1930 he wrote, "I found it 33 years ago", that is 1897, a lapse of 14 years. Lasseter and Coote explained this anomaly by agreeing that Lasseter did find his reef in 1897 but failed to relocate it on his 1911 expedition from Oodnadatta. To solve the water problem Lasseter offers to survey a route for a water pipeline from the Gascoyne River to his reef, "I am a competent Surveyor and prospector and would run the survey for £2000". Two thoughts come to mind here, this is another of Lasseter's begging letters and it may be at this point in time that the I. C. S. certificates and the sextant come to light. In later correspondence Lasseter suggests that £5,000,000. would be sufficient to construct a wooden pipeline from the Gascoyne to the reef, I have visions of a neat row of termite mounds across 800 miles of Central Australia. Then there is a nice piece of hypocrisy on Lasseter's part, the man detested the British for no apparent reason yet he suggests, "there is no doubt that £5,000,000 capital could be found in England to work this mine", this five million in addition to the five million for the pipeline, "English capital is keenly interested in mining projects in W. A. and the Northern Territory". Ten million pounds would be a severe test of English capital during an economic depression. I consider Lasseter's letters to Texas Green and the West Australian Mines Department to be the beginnings of the Lasseter saga, there is no written evidence prior to this date that Lasseter had any knowledge of, or intentions to exploit his reef, and all oral histories before and since have been discounted. There's a sense that the Labor Party's resounding Federal election win that weekend may have inspired Lasseter to write his letters, the climate being right so to speak.